Lange war die Insel wie abgeschnitten vom Rest der Welt, ihre Kultur ein Rätsel. Selbst heute erscheint diese auf dem neuesten Stand des technischen Fortschritts agierende Wirtschaftsmacht in Vielem seltsam antiquiert. Manch eine Verhandlung mit Firmenbossen scheiterte an der Missachtung von Ritualen, die ins frühe Mittelalter zurückreichen. Wer geschäftlich mit Japan zu tun hat, sollte sich in die hier vorgestellte Musik einhören. Wer meditiert oder gar Zen praktiziert, wird manches kennen, kann jedoch auch einige Überraschungen erleben. Der 90-jährige Fumon (geboren in Tokio 1911) spielt die japanische Laute Biwa und singt zwischen den Vor- und Nachspielen alte Balladen, meist ohne instrumentale Begleitung. Fumon ist der einzige noch lebende japanische Musiker, der den um 1900 besonders populären Satsumabiwa-Stil beherrscht. Eine Rarität, mit informativen Texten von Experten im Begleitheft. The gentlemen from the Buena Vista Social Club have some unexpected competition from the Far East in the form of ninetyyear old Yoshinori Fumon, born in Tokyo in 1911. Celestial Harmonies is pleased to add to its catalogue of important cultural documents, a recording by a master without equal in the tradition of ballad singing. Says John Schaefer of WNYC-FM, producer of New Sounds, "This is some of the most rarefied music I have ever heard." During Fumon's childhood and youth in Nara, near the Kansai region metropolises of Osaka and Kyoto, the biwa was one of the most popular forms of musical entertainment in urban areas with some performers reaching a status of fame comparable to that of popular music artists today. Biwa is a general term in Japanese for lutes that have frets and are plucked with a wooden plectrum. Early forms of biwa were introduced to Japan from the Asian continent well over a thousand years ago. With the exception of modern instrumental compositions, biwa music involves musical recitation to the accompaniment of the instrument. "Accompaniment" of the voice by biwa is quite different to accompaniment as practised in most Western music: the singerreciter plays biwa in preludes, interludes and punctuating strokes between phrases of text, so that there is little overlap of vocal and instrumental sound. Clear enunciation and communication of the text to those listening is of utmost importance, even in segments where the vocal melodic style becomes florid. In the modern era, Kokichi Nishi and Tsunekazu Yoshimuzu came from Kagoshima to the new musical capital, Tokyo, and from the mid1880s, taught the regional music style to a substantial number of students. Both were summoned to perform for the Meiji Emperor, who expressed particular enthusiasm for the performance style of Nishi. It was from this time that the recitation and instrumental tradition was refered to as Satsumabiwa, and began to acquire popularity throughout Japan as a narrative style that reflected contemporary values in keeping with nationalist ideology of the late Meiji era. It is the seiha, or "orthodox school", performance tradition within which Fumon learned during the 1920s and early 1930s. 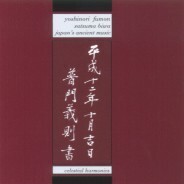 His repertory of instrumental pattens which can be used improvisatory in each performance represents an aspect of the tradition no longer heard in performances by other Satsumabiwa players. Trained by performers from Satsuma at the end of modern biwa music's "golden age", Fumon is the only such seiha performer to have remained active beyond the late 1980s, and to have passed on his skills and knowledge to a small number of students. He is the last survivor of this ancient tradition. This rare and important recording has been put together with the very highest level of expertise. Booklet and annotation are provided by Professor Hugh de Ferranti, Departments of Asian Languages and Cultures/Musicology, University of Michigan and Thomas Charles Marshall, a student of Fumon sensei since 1995, who also produced the recording. 2 Sakuragari (Cherry Blossom Hunting) 22'35"
3 Hanamomiji (Maple Leaf Flowers) 19'47"
4 Fuji no Takane (Fuji's Lofty Peak) 10'19"